The Clemco air control valve (ACV) allows the blast operator to control the volume of air to the Clemco high-pressure Type CE, continuous flow, air-fed respirator within a preset range of 7 to 15 cfm. 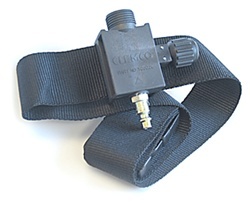 The valve comes with a belt that adjusts to fit up to a 54-inch waist. The durable buckle can be fastened and unfastened with gloved hands. The air control valve is placed between the respirator air supply line and the helmet breathing tube. The operator may adjust the volume of air entering the respirator. The air control valve cannot be closed completely, so the operator always has sufficient air volume for breathing and to maintain positive pressure inside the helmet.